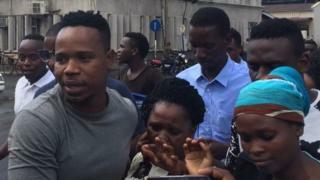 Tanzanian rapper Emmanuel Elibariki, known as Nay wa Mitego, has been released just a day after he was arrested for releasing a song deemed insulting to the government. The song emerged last week and has been widely shared on social media. One line in it asks: "Is there still freedom of expression in the country?" and refers to a "doctor" who can't tolerate criticism. The information minister said President John Magufuli "loves" the song. He also suggested that it be "improved" to take on other issues, such as tax evaders, corrupt businesspeople and drug traffickers, said Information Minister Harrison Mwakyembe. Nay wa Mitego's arrest came days after President Magufuli warned media to be careful about exercising freedom. "Media owners, let me tell you: 'Be careful. Watch it. If you think you have that kind of freedom - not to that extent,'" Mr Magufuli said. What has Magufuli done in office? Police earlier said the rapper would be questioned "for releasing a song with words that malign the government". He was reportedly held at a hotel in Morogoro, before being transferred the 190km (120 miles) to the commercial capital Dar es Salaam. Other lines in the song said: "Who are you now? Don't you want to listen to advice? Don't you want criticism?" The lyric is addressed to someone he calls "a doctor specialising in lancing boils". The phrase "lancing boils" has been used repeatedly by Mr Magufuli to refer to people he deems obstructive. Mr Magufuli, who came to power in 2015, presents himself as a no-nonsense man of the people, unafraid of sacking corrupt or incompetent officials. Recent opinion polls have suggested he is popular, but critics accuse him of an impulsive style of governing and being intolerant of dissent. Another line in Nay wa Mitego's song goes: "I see you handed a club to a madman," which has been interpreted as referring to an official appointed by the president who has been accused of heavy-handed behaviour. Nay wa Mitego is popular for his scathing lyrics, attacking not only the government but even his fellow artists. On his social media accounts he uses the name "NayTrueboy", saying he always speaks his mind and tells the truth. President Magufuli has recently come under intense pressure, with his critics accusing him of undermining democracy by curbing dissent and stifling free speech. Several people have been arrested for posting comments on their Facebook pages deemed insulting to the president and a couple of media outlets have been shut down over their criticism of the government. With Nay wa Mitego's arrest and subsequent release, people are left wondering what role the president or his staff played in all this - did they ask police to arrest the rapper or did the police take this action on their own initiative? And who determined that he should be freed? Did he satisfy police that there was no case to answer or was he let go because his detention was embarrassing the government?